Soma is a clear departure from the old “passive EQs are for general shaping only” paradigm. 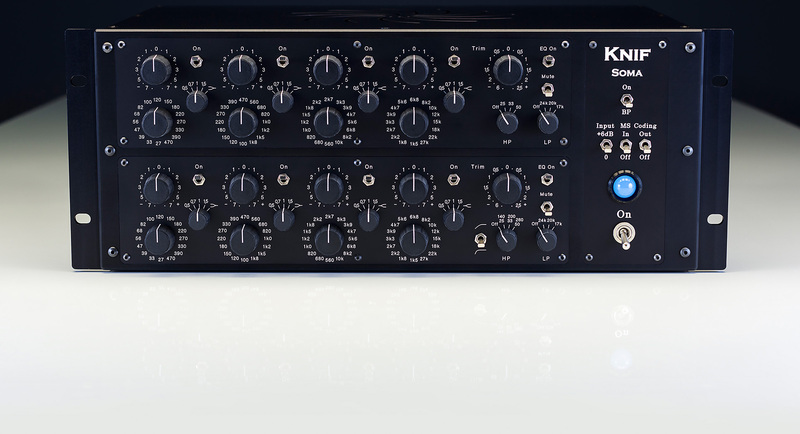 It is the only commercially available passive EQ with real Q adjustment, which makes it more usable and accurate than other products which use only a resistor based Q adjustment which affects boost/cut amount and does not offer a wide range. It is not surprising that this type of ”real Q adjustment” passive EQs have not existed before Knif Soma. When passive circuits reigned the EQ world there was no feasible technology available for the rather complex requirements. And when engineers started to require more control, active circuits were already there and thus passive designs were abandoned until it was realized that they offer superb sonic results. It was taken for granted that they have their limitations and were used accordingly, until now. Because reliability and long time ease of repair is important, there are no programmable ICs or microcontrollers. Only basic CMOS logic is used. Relays are rated for 100 million operations and thus it is likely that not a single one will ever break. Filter caps are mostly polypropylene. Only in the lowest range it was necessary to use some polyester ones. Coils (enclosed in mu-metal) are hand wound by J. Knif and have maximum amount of taps to make the Q-adjustment possible. Make up gain amplifier is a simple two-stage affair with moderate amount of DC-coupled feedback, with tubes of course. Individual discrete regulators for anode supplies, mu-shielded signal transformers, all teflon/copper/silver wiring, no connectors on signal path, only solder joints, the list would go on and on. Objective performance is flawless, Soma is a mastering quality product in every respect. As an icing on the cake all knobs are from Elma’s ”soft touch” collet knob range, offering substantially warmer feel and better grip than normal hard plastic knobs. Note that front panel markings for gain are for every other position, switches are 23-position Elma rotary switches . Frequency (16 positions per range) and Q-value selection is done with binary logic switches, also from Elma. There are no potentiometers. This is a product for mastering and made to last.